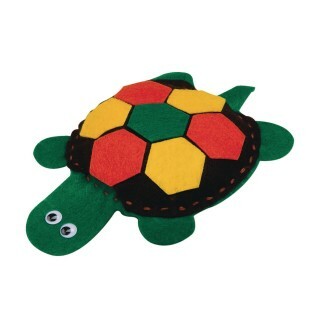 Hardest to do one-handed; therapists may need to hold turtle during stitching and stuffing. Kit includes precut felt pieces con sisting of turtle bodies, shells, tummies and 3 colors of plates. Also included are wiggly eyes, non-toxic glue and fiberfill. Size: 5-1/2" x 8-3/4".